Joel Magarey's Exposure is a unique travel memoir. Joel set out on an around the world odyssey while trying to leave the love of his life and cope with his obsessive compulsive disorder. Joel recently told me about the horror of re-drafting from scratch, avoiding danger and ice selling as good preparation for writing. Hackpacker: According to your bio you've been an ice salesman, juggler and a journalist. Do authors feel obliged to play up the kookier parts of their lives when writing their own bios? How do you think these jobs feed into your writing? Joel Magarey: Ice-selling fed into my writing by... okay. You got me. It didn't. Yeah, you feel that obligation, because you want people to see you as an interesting human not a list of publications. On the other hand developing a financially rewarding comedy juggling act required learning how to make people laugh. And I think journalism demands that you learn to see detail and hones your sense of what interests people. It also forced me to write in short and clear sentences – which, God, I needed after university. HP: How do you describe this book - is it memoir? Travel writing? A love story? JM: It’s memoir. I describe it as a memoir of love and travel with a psychological edge. The love story is the main narrative driver but there's also an overcoming-illness quest and a will-he-get-back-to-Australia-in-one-piece element. The three threads of the book, love, travel and mental disorder, are all woven into each other in terms of both the story and the book’s preoccupations. HP: Exposure follows your travels while wrestling with Obsessive Compulsive Disorder. So beyond the quote that the title comes from, writing this book was 'exposing' on a couple of levels wasn't it? JM: Many levels. Most obviously, in writing the book I have as you say revealed the bizarre compulsions and obsessions I experienced when I was prey to OCD. Call them fearful illusions. But perhaps even more ‘exposingly’, I’ve also described the many non-pathological illusions of desire I had – post-Catholic sexual greed, immature fantasies of love, grand expectations of career and adventure. With these I don’t have the protection of a diagnosis which makes it almost scarier. But I had to bare all this to tell the story, because it is fundamentally about how these powerful illusions of desire and fear can sabotage the capacity to love, value and have real people and things. Of course there’s also plenty of physical exposure in the book: nearly drowning, setting fire to my tent, snapping stalactites off my nose, that sort of thing. But the deeper sense of exposure in the book is the journey away from illusory freedoms and securities towards exposure to the dangers inevitably involved in committing to realities such as accepting you have a mental disorder or proposing marriage to a (real) woman. As Helen Keller says in the quote you refer to, cited in the book: ‘Security is mostly a superstition…Avoiding danger is no safer in the long run than outright exposure’. It’s no coincidence the therapy of choice for most anxiety disorders is exposure therapy. But you don’t have to have an anxiety disorder to reap the paradoxical benefits of exposure. I recently wrote a piece expanding on all this in The Punch. HP: In writing this book you did a complete re-write from scratch - that's pretty gutsy stuff. Were you terrified when you started that re-write? JM: It was scary, and I felt a great inner groan at the years of work I had just taken on. But the hardest part had been earlier – deciding to abandon all that work: admitting to myself I’d spent two-and-a-half years writing a book that wasn’t up to scratch. On the other hand, that decision was the key to getting published, because I finally let go of the first version’s inbuilt flaws. HP: The book's structure really jumps around through time and place - was that a conscious decision to cut the story up or did it evolve as the best way to tell the story? JM: I had planned the book with two narratives in mind. The story alternates between the global journey in the present – in which I think I’m escaping but am essentially orbiting a ridiculously lovable woman, Penny – and past-tense sequences recounting the genesis and first outbreaks of OCD and the early romance and adventures of the long love with Penny. They are actually both linear chronological narratives, advancing side by side, and each past-tense sequence bears some relationship to something that’s just happened on the world trip. And after ‘touching’ in this way all through the book the two narratives meet up definitively at the end. HP: What are you working on now? Can we expect that parliamentary reporter tell-all soon? JM: Actually, as long as I’ve worked in Parliament House I’ve thought it would make a great setting for a thriller – a bloodied body is discovered in the beautiful, lush gardens, and perhaps there’s a Murray Whelan type in the place; a Hansard reporter perhaps? And it gets all political. Someone else can write that. My next project is to have a holiday. Then I’d like to put together a book of travel stories – half fiction, half non-fiction. A book of poems wants to see the light of day too. But after 10 years of Exposure, the holiday first. 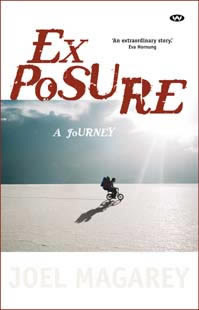 Exposure will be launched at Readings Carlton on Friday 9th October. Interesting article, and the Hackpacker site is full of gems. Loved the interview/profile with Paul Auster.